Next time you’re making dinner, get your little one to help out! Try some of these kitchen tasks for toddlers. When my son was around 18 months old, he started joining me in the kitchen on his Kitchen Helper Stool (we don’t have this exact one but ours is similar). Now we use a kitchen chair because I’m too lazy to pull the stool out of the closet most of the time! 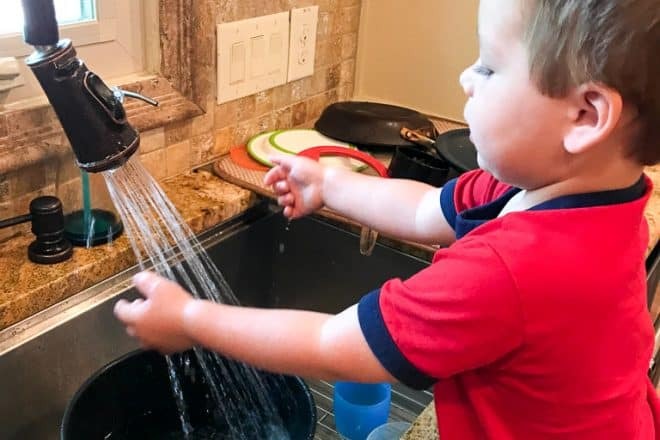 He has gotten more helpful and involved now that he’s about a year older, but even at 18 months he liked watching what I was doing and could do some simple tasks, like helping stir things. Practice counting with things like eggs, carrots, potatoes, etc. Then have your toddler put them into the bowl or pot or wherever they need to go next. We were getting ready to hard boil (actually, steam!) these eggs, so I was right there to make sure he did it verrryyyy gently to keep the eggs intact. If it doesn’t have to be a perfect measurement (and you don’t mind some spillage) allow your toddler to scoop things with the measuring cup. You can do this with dry ingredients, like oats or rice, or liquid, like water or milk. I usually keep a hand on top of his to help steady him. Then the best part – they get to dump it into the bowl! Toddlers love to stir! Even if it’s something that doesn’t necessarily need stirring, I’ll let him do it anyway for fun. I know this seems so simple, but they think it’s fun to play at the sink. This does have some sharp blades so I very closely monitor, but your kids will think this thing is magic. They can get involved in every step of the process. Rinse the lettuce and other veggies. Spin the lettuce in the salad spinner. Tear the lettuce into small pieces and put it in a bowl. They can even help toss it with the dressing. Ha! We have a Nespresso and Teddy LOVES pressing the button. Pressing buttons in general is fun, so I’ll let him press buttons on the oven or dishwasher for me. A cookie scoop and tongs are both great tools to practice some fine motor skills. Sometimes I’ll set Teddy up with tongs and some items to put in a bowl (even small toys), and he gets VERY focused. Ask your toddler to bring things to you that you know they can handle without spilling or breaking. We keep some kitchen supplies in low cabinets, like our colander and mixing bowls, so I will ask Teddy to bring those to me, or put them away if we’re cleaning up. He also loves to put things in the garbage can. I don’t expect my toddler to do a great job with this, but he can help, and it keeps him entertained while I do something else in the kitchen. They can rinse out non-breakable dishes, help wipe surfaces down, and even help with sweeping or vacuuming. When he’s in the kitchen I make sure to only use my safest, most non-toxic cleaning supplies just in case he sprays himself by accident. You can always just fill a spray bottle with water and let them go nuts. Don’t forget to let them taste! This has been one of the best ways to get my son to try new foods. If he’s helping or watching me prepare food, he gets curious and wants a taste! What are your favorite kitchen tasks for toddlers? Do you have memories of helping in the kitchen when you were little?